This biography of Rachel Carson, Jane Jacobs, Jane Goodall, and Alice Waters demonstrates the fluidity between private and public spaces and how they were able to traverse that line. Consciousness raising is certainly a tool that gets to the root of oppressive social systems. Yet few people pursue their interests and talents with the intention of igniting a social movement. 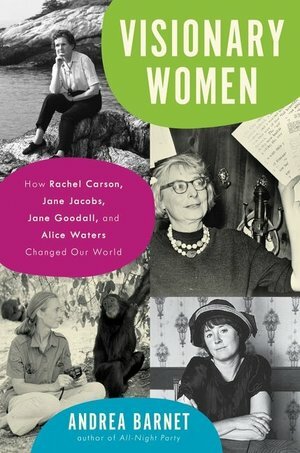 The subjects of Andrea Barnet's Visionary Women: How Rachel Carson, Jane Jacobs, Jane Goodall, and Alice Waters Changed Our World were reluctant public intellectuals who undoubtedly contributed to radical social change. Barnet's group biography examines the contributions of Rachel Carson, author of Silent Spring; Jane Jacobs, urban space activist; Jane Goodall, primatologist and global activist; and Alice Waters restaurateur and mother of the local foods and slow cooking movements. For all these women, their activism began with a simple question stemming from an observation. But as their research and activism progressed, they all registered the dire consequences of trying to bend nature and natural systems to serve society's endgame. Visionary Women expertly makes the connections between these women's monumental cultural impact. The book is divided into four distinct chapters, one for each woman. Barnet provides enough background context to understand each woman's standpoint while also exhibiting how their distinctive projects influenced wider discourses. As the text progresses Barnet offers interesting comparisons to previous chapters without including any spoilers on the subjects yet discussed. Barnet includes photographs to supplement each chapter. Especially for Goodall, photography was a major component of her research. Barnet writes at length about Goodall's work with the primate named David Greybeard. It was satisfying to flip the page and see the captivating images of the scientist and chimp. All four women's activism stemmed from their everyday observations. Jacobs literally sat at her window and watched her neighborhood as the fieldwork for her text The Death and Life of Great American Cities. She noticed that her neighborhood was a complex network where "strangers were drawn together" (171). Carson observed that DDT decimated birds and wondered about the pesticide's impact on humans. Likewise, Goodall sat in the primates' terrain, watched their behavior, and even recorded signs of primate ritual. Waters understood that manufactured food and the commercialized agriculture industry threatened a person's connection to their food. Barnet is careful to include how each woman's work "emphasized the interconnectedness that undergirded the living world" (51). Interconnection is essential to how readers understand the past but also how Carson, Jacobs, Goodall, and Waters influenced our present. Visionary Women showcases women who dared question an androcentric society. All four of the book's subjects identified a social issue that was exasperated by bureaucrats and systems men who "in their self-importance assumed they knew what was best for the people, with little concern for what they actually wanted or needed" (121). This sentiment still echoes in our contemporary discourses and is often the main criticism directed at politicians or anyone meant to represent us. Through these women's histories, Barnet reminds readers that true democracy and the inclusion of multiple voices is necessary to make progress. The women featured in Visionary Women were outsiders. When they began their careers, Goodall and Jacobs were untrained in their field. Carson had transferable skills from another discipline while Waters gained knowledge from sensory learning, hospitality, and making mistakes. Therefore, Visionary Women offers the reminder that a single question posed by a perceived outside can create an effective social movement. During these women's eras, there was a gendered distinction between public and private spaces. On the one hand, men were socially constructed to be active and this occurred primarily in the public sphere. Jacobs turned this norm on its head. She returned neighborhoods to its denizens and took power away from the male-dominated municipalities. On the other hand, women were socially constructed to believe that private space, such as the home, was their primary responsibility. Goodall's research was conducted living in the rugged Gombe Stream Chimpanzee Reserve. Due to the extreme conditions, the scouts hired to chaperone her left. Her austere camps were the bonafide antithesis of private spaces. Visionary Women demonstrates the fluidity between private and public spaces and how women were able to traverse the line. I wanted to learn more about the author's methodology in selecting Carson, Jacobs, Goodall, and Waters. In the preface, Barnet mentions that she put them together because they represent a "shift in consciousness that produced radical results" (xiii). However, including women of color who also produced radical results would have made the text stronger. The subject matter is very narrow and reiterates some of the mistakes initially made by second wave feminism. By opening up the group biography to include women of color, it avoids seeing history making as the realm of white people. Barnet is an engaging writer and Visionary Women is entertaining, informative and inspiring. By authenticating the connections between Carson, Jacobs, Goodall, and Waters, Barnet offers a fresh perspective on well-biographed individuals. In doing so, Visionary Women aligns these individuals' philosophies while raising interesting questions about what it takes to shift paradigms and invigorate the collective.